Tough on stain removal. Kind next to skin. Dermatologically tested. Simply remove tablets from flow-wrap and place tablets directly into drawer. This box gives 20 standard washes on normal soiling and medium water hardness. A Non-Biological product does not contain enzymes. Many people have found Persil Non-Biological formulations particularly suitable for their skin. 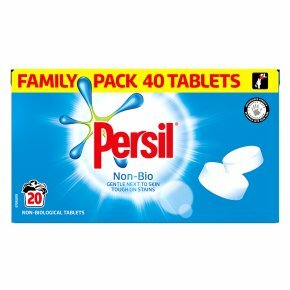 WARNING<br><br>PERSIL NON-BIO <br>NON-BIOLOGICAL WASHING TABLETS<br><br>Causes serious eye irritation.<br><br>Keep out of reach of children.<br>IF IN EYES: Rinse cautiously with water for several minutes. Remove contact lenses, if present and easy to do. Continue rinsing.<br>If eye irritation persists: Get medical advice/attention.